Threadsy is a new web service, which was recently launched during TechCrunch 50, that aggregates all online communication into one place. 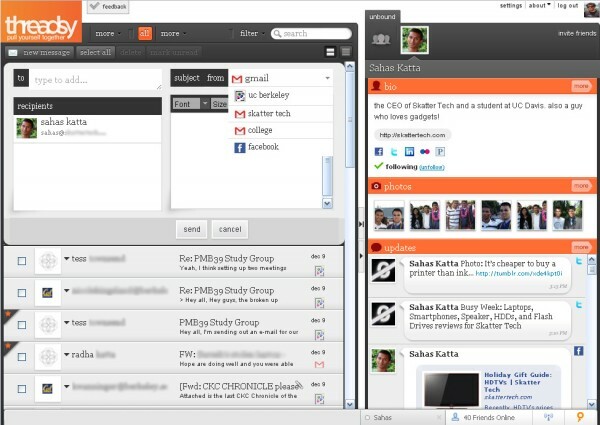 It pulls data from email accounts, social networks, and instant messaging protocols together into one screen. I assumed it would be a bit overwhelming at first as many of you may, but Threadsy’s organization actually makes it work. Threadsy currently supports emails from Gmail (including Google Domain Apps), AOL Mail, Yahoo! Mail, and Hotmail. There’s full support for IMAP too. It pulls in Facebook and Twitter for social networking and Meebo for chat accounts. If you’ve used Meebo before, you’re probably well aware that it supports AIM, Yahoo! Messenger, Windows Live Messenger, Google Talk, ICQ, Jabber, MySpace, and Facebook all through a web browser. The interface is split up into two columns: inbound and unbound. The inbound column displays a syndicated feed of all email accounts, Facebook messages, wall posts, Twitter direct messages, and @mentions. You can also single out an email account and filter it by unread or starred messages. Emails can be deleted, starred, or even archived (for Gmail). Any changes made through Threadsy is reflected on the respective email service. For composing mail, Threadsy offers a rich text editor, the ability to send mail from any email account, and include attachments. When choosing a recipient, Threadsy auto-fills contacts from email accounts and even cross checks Facebook for profile pictures. Unfortunately Threadsy is unable to send Facebook messages from within the user interface at the moment, but will still redirect you to Facebook to compose the message. Overall, I was quite impressed by the organization and functionality of the email aggregation. The second column, unbound, manages social networks. Threadsy only supports the two popular social networks at the moment: Facebook and Twitter. There is one feed that combines both Facebook status updates and tweets, but also has the option of filtering down to only one service. There’s support for multiple Twitter accounts as well. Threadsy allows updating both Facebook and Twitter statuses at once. From within the Threadsy interface you can view/leave comments and ‘like’ Facebook statuses. For Twitter you can retweet, reply, and favorite tweets. Clicking on a contact will display a combined profile page that displays a feed of both Facebook and Twitter updates. In addition to the in and out bound columns, there is a chat bar at the bottom which uses Meebo. The bar stays out of the way of all other communication, but is convenient enough to access chat accounts at any time. It also supports using a universal status and customizing online/offline per account. Keeping in mind that this service is still in beta, it still has some bugs. The team at Threadsy has done an incredible job of putting so many services into one functional page. It’s rare to see something useful fall into our radar with so many pointless start ups in the making. 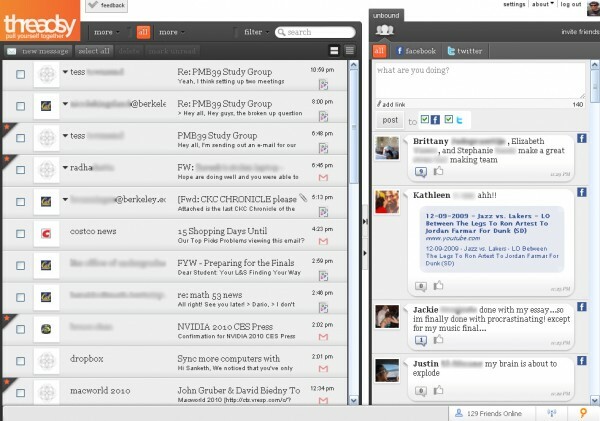 In the move towards cloud computing, Threadsy could very well be the future desktop email client. While I was skeptical to try this service at first, I have now begun to use Threadsy to manage all my online communication. While I do still experience occasional hiccups, those will hopefully be resolved with further development. This service has real potential and I look forward to see where the company will take it.